Yesterday’s post was about one of Maui’s oldest sweet treats, Roselani Ice Cream, and today’s post is about one of the newest – Maui Fruit Jewels. 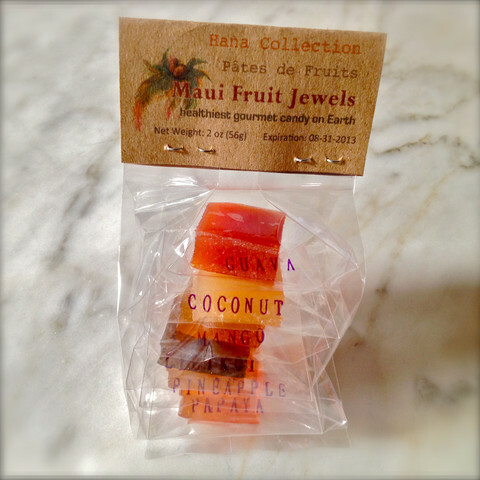 Maui Fruit Jewels is a line of gourmet fruit candies, based on the French confection called “pates de fruits”. They are produced and distributed by Maui Epicure LLC, a company founded in 2012 by Lin and Chris ter Horst. Lin ter Horst, who holds both an MBA from New York’s Columbia Business School, and a diploma in pastry arts from London’s Le Cordon Bleu, answered some of our questions about the special confection, and about the birth of this new company. Maui Made: How are the fruit jewels made? Lin ter Horst: We make our fruit jewels utilizing the traditional European method in small batches. 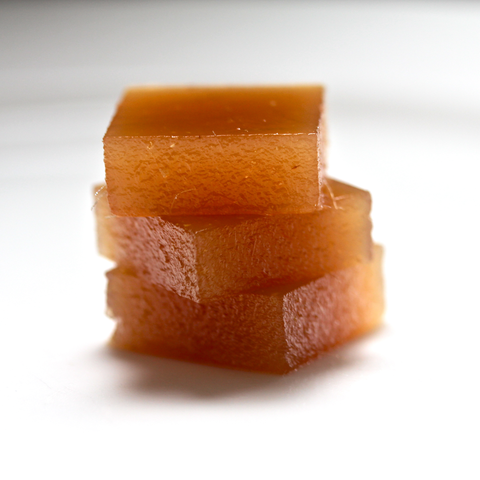 We cook all of the ingredients: the respective fruit or vegetable or wine, organic sugar, glucose syrup, pectin, and citric acid together for a long time, then we pour the mixture into a mold to let it set. Then we cut the candy into individual squares. 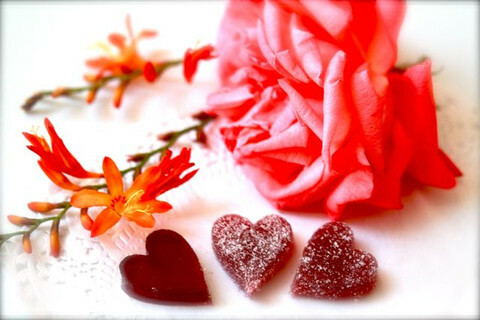 Our candies contain no gelatin or carrageenan, no emulsifier, no added flavoring or color, and are gluten-free and vegan. MM: What are your most popular products/flavors so far? Lin: All of the fruit varieties we use are intensely flavorful, slightly tangy and not too sweet, with some flavors spicy flavors including ginger and jalapeno. The most popular flavors are lilikoi (passionfruit), ginger pineapple, followed by coconut, beet, guava, jalapeno. We have a popular assortment called the Hana Collection which contains the six tropical flavors popular with visitors: guava, coconut, mango, pineapple, lilikoi, and papaya. MM: How are the fruit jewels best enjoyed? Lin: Our fruit jewels are enjoyed similar to how the best chocolate confections are enjoyed – without guilt, and preferably with a dessert wine and some cheese. You may also sprinkle a small amount of diced pieces onto yogurt, ice cream or use as garnish on a dessert plate. MM: Do you offer the fruit jewels for weddings or corporate events? Lin: Yes! We can even make custom flavors or packaging with enough lead time. MM: Where can people buy Maui Fruit Jewels? Lin: We are at the Upcountry Farmer’s Market in Pukalani most Saturdays, and they can also be found at Tutu’s Pantry in Kihei (inside Kihei Kalama Village) and Kula Marketplace, on online on our website. MM: How did Maui Fruit Jewels get its start? Lin: We moved to Maui in July 2012 from China, where we were living for the five years prior, and where Chris and I met and got married. I got my diploma in pastry arts from Le Cordon Bleu in London in 2008, after the financial downturn ended my short stint as an investment banker in China. It’s funny how my pastry training at Le Cordon Bleu really changed my life. One day in class, our chef instructor brought a bucket of cherries to the classroom and passed it around the room for us to sample. It was the most incredible thing I’d ever tasted. They were Griottines – Morello cherries soaked in kirsch (cherry liquor) from the moment they were picked from the trees in France. We were there to make a black forest cake, but these kirsch-laden cherries turned an ordinary confection into something truly spectacular. The Griottines website would tell the story about how these cherries were harvested and preserved. In a chocolate confection class a month later, we’d come across these little treasures again, this time with the stalks still attached. We dipped them in fondant and then dark chocolate, turning them into irresistible chocolate bonbons. Back in Beijing, I found a distributor for Griottines and started buying large jars of them, I even incorporated them into pastry classes I was teaching. I blogged about my addiction to the cherries on a Chinese microblog site and many curious locals would be turned on to the cherries because of my blog. It was the Griottines that got me totally obsessed about the potentials of value-added products. I studied all the value-added products that I came across wherever I went. We’d be vacationing in southern China and I’d marvel at how people would just drink juice out of coconuts and then throw away the coconuts. (After moving to Maui I’d learn that there are coconuts good for just drinking.) I’d be thinking, why couldn’t these guys make virgin coconut oil that the Malaysians are trying to import to China. Anyway, you get the picture, I was obsessed. So after we arrived in Maui, I naturally began to look for all the value-added products. Aside from the jams, jellies, and syrups, I didn’t find too many other food products that really took advantage of the abundance of fresh fruits, flowers, herbs and vegetables available on Maui. This of course did not surprise me. I did not expect to find anywhere outside of Europe where value-added food products would be an important industry. This meant opportunity. It took me two months to decide and finally find the courage to tell Chris that I was convinced that it was a good idea to start a company on Maui to make Pates de Fruits using local fruits. Chris didn’t remember the taste of the confection we bought in Paris a few years ago at a confection store. Happily, Chris has been very supportive in most things I’ve wanted to do, often with little understanding of what they actually are, so I had to quickly move to capitalize on the asymmetry of information before it was too late. 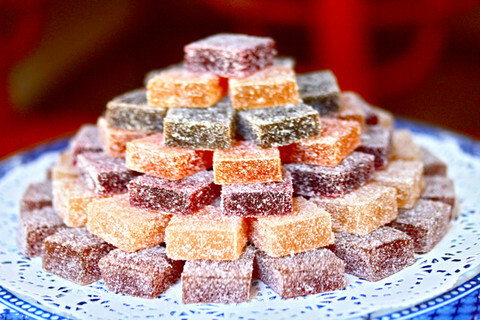 In September 2012 I started experimenting with making pates de fruits almost everyday. It was really difficult. Three months later I finally made a batch that came close to my idea of pates de fruits were suppose to be like. This was by far the most difficult food product I’d ever made. MM: You have been all over the world, what brought you to Maui? I’d been dreaming about moving to Maui since the first time I visited, about 12 years ago. I was working in financial services in New York City. In 2006 I seriously considered moving to Maui. But I was a single mom with a very young child and I didn’t have the guts to do it. I also didn’t feel like I had much to offer to the community even though I had an MBA from Columbia with years of business experience. In 2010 I took Chris and Lilah to Hawaii on a vacation, while we were living in China. They both loved it. Chris went on a tour to see lava flowing into the ocean on the Big Island. He likes that kind of stuff. In 2012, Chris and I decided to leave China, for a multitude of reasons – quality of life, Lilah’s education, career, the usual stuff. Chris wanted to move to a country in southeast Asia, as he is from the Netherlands and loves the tropics. More importantly Chris was all set on pursuing a career as a professional triathlete and he wanted to be at a place where he could train all year round. I had enough of third-world country shenanigans, and wanted to return to the US to start a business where I’d be able to leverage my fine pastries/confection-making skills and business experience. For a long time we couldn’t agree on a place both of us would be happy to call home, until Maui came up as a potential destination. We are still congratulating ourselves on making such a wise decision, on moving to Maui. MM: Any tips for others looking to turn a passion into a business? Lin: When you are passionate about something, you want to do everything your way, according to your vision. That’s why you are passionate, because it’s your baby. When you go into business, you’ll quickly discover that market forces will take over, and your own ideas are less important. For example, I’m passionate about creating an artisanal product that is free of food coloring and flavoring, that is as natural and authentic as it can be, using the most environmentally sustainable packaging materials. This means my costs and therefore prices are high. If there is not enough of a market segment to support our products, then we’d be at a cross-road. I obviously believe that there will be enough of a market for our products. But if I’m wrong, then I would have to decide between 1) lowering the quality and price points of our products in order to appeal to a bigger market segment so that I’d still have a business, even if it’s not producing the exact same product I set out to produce, or 2) folding the business. If you are more passionate about your products than the idea of just having a successful business, and are willing to fold the business if your products are not immediately accepted by the market, you will do your everything in your power to find and even create markets for your products. If you are more passionate about having a successful business no matter what it takes, you will be less hung-up on your products, and more flexible in adapting your products to the market. Hopefully you will find the perfect balance between retaining the integrity of your products, and running a successful business. MM: What’s next for Maui Fruit Jewels? In 2014 We will be expanding our sales and marketing efforts to cover the other islands, the mainland, Europe, and Japan. Mahalo to Lin and best of luck with this delicious venture!